Recently, I had a funny experience while I was entering some data in an Excel sheet. Well, I don’t really use Excel that often so that makes it pretty obvious that I would end up doing some crazy stuff. I wanted to type two lines in one cell in Excel but whenever I typed the first line and hit enter it would jump to the next cell. And, then finally I asked my friend and figured out that I should hold the Alt key and then hit Enter so that the cursor jumps to the next line for not the next cell. 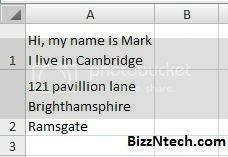 This way you can enter multiple lines in a one excel cell.